Anyway, I was already in it so I decided to put on my big girl hat and start making it into something I would want to come home to; a place for my daughter to grow up and have sleepovers; a place for us to be family. 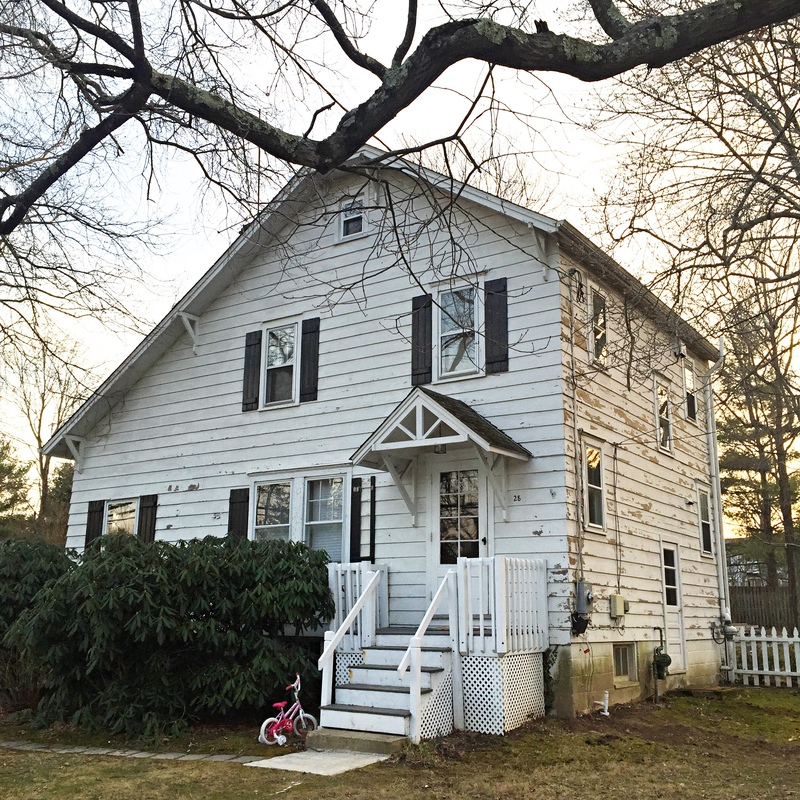 The process begins on restoring our historic colonial house! Well, this is the obvious before picture. It goes without saying, it needs a ton of work. The entire house is covered in lead paint that needs to be scraped by hand. The siding was pretty rotten. There were puddles of water settling around the house due to poor drainage and off course all the trees were close to toppling over the house. There you have it! My “after” picture. Its the beginning of a long process in restoring this historic house. With it being built in the late 1800’s, the foundation is solid and it was definitely built to last. 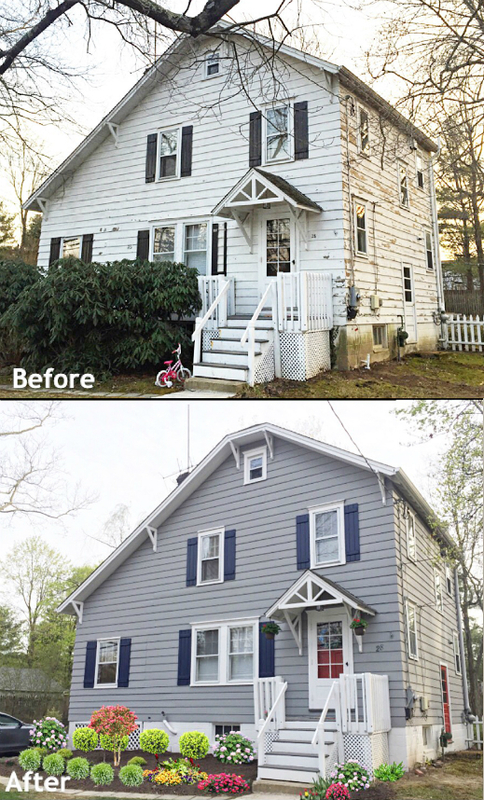 I pulled out the last bit of savings I had and scraped the lead paint, hired someone to remove the lead safely, cut back all the trees from the house, replaced all the rotten wood, repainted the entire exterior and redid the landscape. The lead could not be completely removed because sanding lead paint in illegal. So, it looks a bit blotchy up close but better than before to say the least. 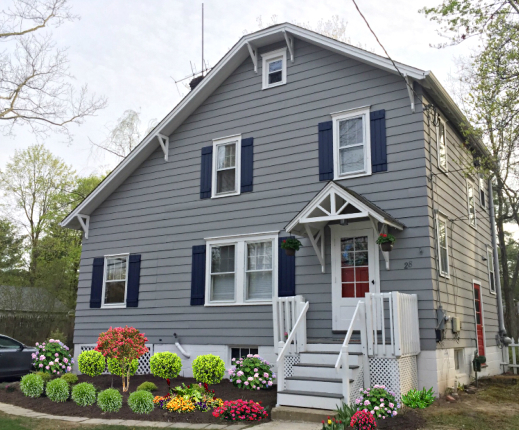 For the color scheme I chose all Sherwin Williams paints: Pewter Cast for the main body, Naval for the shutters, Snowbound for the trims, and Rave Red for the doors. For the landscape, I just did some boxwood plants at the back, some lilacs on the sides and a few gardenias in front. Turned out really pretty and I am sure will look much better once it’s all filled in. I went through about 100 different color combinations and I am still not sure if this was the right choice. I wanted a soft slate blue in the beginning but stuck with gray, blue and red combination. 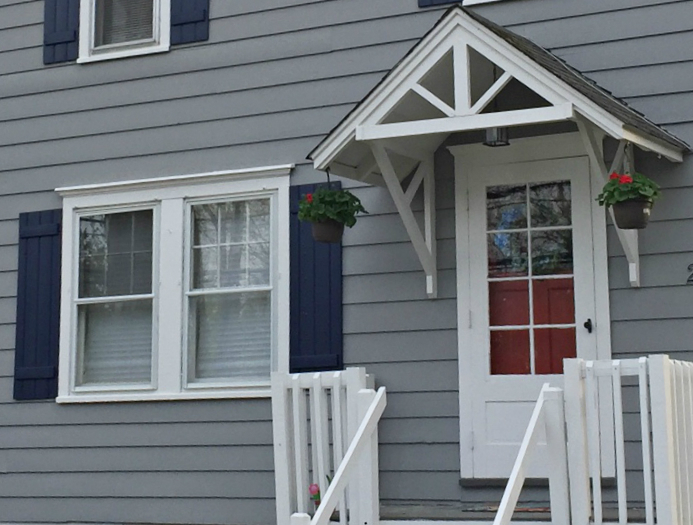 I love the naval blue against the red door but not so sure about the gray yet. Thanks for visiting and now back to sewing!